Austin, TX appears to be ground zero for the electronic traffic signs hacking threat, as the "top story" on last night's local news demonstrates. The hacked electronic road sign video from the Today Show was apparently based on the "top story" from Austin NBC-affiliate KXAN proves America also has slow news days, though decidedly more entertaining ones. We Told You Not To Hack The Electronic Road Signs, Didn&apos;t We? Not surprisingly, the hacking occurred at an intersection within a few blocks of the University of Texas at Austin and right down the street from where we used to live. In fact, we shared a room with a Computer Science major capable of just such a prank... David? Was this you? 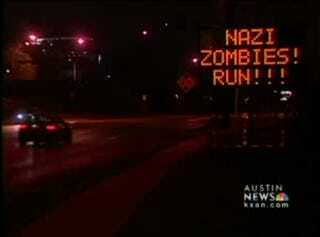 We recommend you run for it because according to the City of Austin Department of Safety police are after you! Being full of bored college students and undergoing perpetual road construction, Austin is a prime target for this kind of pranksterism. The best part of the video is at the end when the reporter mentions the most disturbing part of the story is the existence of websites explaining how to do this sort of hack. We think the most disturbing part is the people who might attack the transients on The Drag thinking they are zombies as opposed to just stoned.